Annette Lemmer was working a cold, cloudy Sunday morning as a 911 dispatcher in the Public Safety Building when an emergency call came in at 11:22. The frantic female caller was 27-year old Christina Cardenas of 118 Blaine Avenue. She had to speak loudly to be heard over the smoke alarm blaring in the background as she implored Lemmer to send an ambulance to her home. Lemmer identified the background sound and asked if there was a fire. Cardenas answered that, yes, there was a fire, a big fire that they couldn't put out. Within seconds, Lemmer sent the alarm to the Galesburg Fire Department. Cardenas lived in an older home, one of many in Galesburg that had been converted into a two-unit rental, upper and lower. She lived in the lower unit with her three-year-old son Joseph, known as ''JoJo.'' In the upstairs apartment lived 22-year-old Stan Lapinski and his young son, Stan, Jr. The elder Lapinski was out of the apartment when the fire erupted and his son was being watched by babysitter Greg Hillier. Downstairs, JoJo and his mother were accompanied by Christina's friend, Dustin Bannister, that morning. Sometime prior to Christina's 911 call, a fire had broken out in her bedroom on the home's north side. The bed was piled high with clothes and blankets. Firefighters later found the remains of an ashtray, numerous cigarette butts, and beer cans surrounding the bed, according to Assistant Fire Chief Jim Scherer who subsequently investigated the blaze. Fire investigators have now determined that this bed, near the center of the headboard, was the origin of the fire. Cardenas and Bannister told police and fire investigators that they tried to extinguish the fire themselves before calling 911. Bannister reportedly attempted to smother the fire with a towel while Cardenas tried to throw water on it. While statements from Cardenas and Bannister were unclear and somewhat conflicting as to the fire's origin, investigators are pretty sure that careless handling of smoking materials ignited the bed and the clothing atop it. It was only after their attempts to put the fire out had failed and the smoke alarm was sounding loudly that she dialed 911. Shortly after phoning 911, Cardenas and Bannister reportedly left the building but no one saw young JoJo leave. Apparently both adults assumed the other had taken the boy out with them and they each left through different doors -- Cardenas to the rear and Bannister to the front. By the time the two adults met in the yard and discovered that neither had JoJo, the fire was burning ferociously. Charles Martin was on leave from the Army and, with fellow soldier Scott Garbin, were visiting Martin's mother who lived immediately south of Cardenas at 108 Blaine Avenue. Martin ran into the house to say the neighbor's house was on fire and then both he and Garbin immediately rushed outside. When the two soldiers heard that JoJo was missing and presumed to still be in the house, they made an effort to enter the downstairs apartment through the front door. The heavy smoke and intense heat made entry tough and, combined with the men's lack of familiarity with the floor plan, obliterated any chance for success. And firefighters from the Brooks Street station were indeed the first to arrive at the scene -- within three minutes of receiving the alarm. Firefighters from the Central and Maple Avenue stations, along with Battalion Chief Ted Hoffman, also responded to the initial alarm but arrived later due to their distance from the scene and the omnipresent freight trains in the city. Detouring to avoid the blocked railroad crossings cost the firefighters an extra minute or so, according to Hoffman. Several squad cars and ambulances also answered the call. When firefighters arrived at the scene, the structure was ''fully engulfed'' with a huge plume of dark smoke reaching skyward and flames licking at the adjacent homes and vehicles. The plume of smoke was so prominent that Hoffman could see it from downtown as he sped to the scene -- prompting him to initiate a callback of the relief shift. The narrowness of Blaine Avenue and the congestion caused by cars parked almost bumper-to-bumper on both sides hampered attempts to get fire equipment in position. The width of the street barely accommodated a single engine and once the first truck arrived northbound on Blaine, it blocked the street immediately in front of the burning house. The men responding from Central and Maple approached from the north and the street was awash with bystanders, police and others from the beginning. Firefighters Chip Timmons and Mike Sheppard were the first to enter the burning building from the rear entrance in search of JoJo. Unfortunately, they never got further than the kitchen due to the extreme heat; neither firefighter had a chance to really search for the boy before Hoffman ordered them out. As numerous firefighters on the scene noted, this house went up fast and hot -- suspiciously so, and there were other complications to be surmounted. 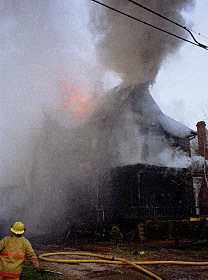 The fire had already began spreading southward when firefighters arrived and the heat was so intense that it not only melted the vinyl siding and gutters of the Martin house, it actually ignited a 1989 Ford Bronco that was parked in the driveway separating the two structures and burst into flames. The heat also damaged a 1986 Lincoln Town Car but, unlike the Bronco that was totally roasted, it sustained only moderate damage and was driven out of the driveway and into the back yard after the fire was under control. The leaking natural gas was a major concern for Hoffman and he was forced to order two of his men to approach the meter low and close the gas valve located just prior to the meter. This was both a difficult and dangerous task that took two tries and Hoffman's personal participation to accomplish. The building was burning at a very fast pace and soon the firefighters efforts shifted, of necessity, to preventing the spread of the fire. Both Scherer and Hoffman said that this fire became so severe for two basic reasons: one was the delay in calling the fire department; the other was the age and construction of the building. This was an old house that had been remodeled into apartments. In the process some inexpensive and highly combustible building materials were used as paneling and ceiling material. The remodeling also resulted in numerous extra hidden cavities between walls and floors that permitted the fire and heat to rapidly spread throughout. The old plaster ceiling had been replaced with cardboard-like ceiling tiles that were affixed to furring strips applied to the original surface. This left an air-filled opening between ceiling surfaces that permitted the fire to spread from room-to-room, eventually with the burning ceiling tiles falling to the carpeting below. It was in this way that the fire spread from Christina's bedroom to the living room and eventually into JoJo's southeast corner bedroom where the ceiling tile fell in the center of the room. Firefighters reentered the house as soon as they could and firefighter Rick Hulick found the badly-burned body of JoJo laying atop his bed with the body of a cat close by. Speculation has been that the boy may have been trying to rescue his cat when the dense choking smoke overcame him. Visibly distraught firefighters passed the lifeless body arm-to-arm out of the house to Galesburg Hospitals Ambulance Service paramedics who were standing by. The boy was rushed to Galesburg Cottage Hospital where Knox County Coroner John Watson declared him dead at 12:25pm. By 12:30pm firefighters had the blaze under control. Joseph ''JoJo'' Younge was not the first fire death in Galesburg this year, according to Cratty. In July, Hoffman's shift responded to a small gasoline fire in a basement that was quickly extinguished. While there were no apparent victims at the time of the fire, Hoffman informed both Galesburg hospitals to call him immediately if anyone presented himself or herself as a burn victim. Later that evening, Madeline Jackson sought treatment at St. Mary Medical Center for burns on her hips and legs. Jackson developed a blood clot following treatment of those burns which caused her subsequent death. Scherer also pointed out that while the number of structure fires were down in 1998 (55 versus 66 in 1997) structure fires are trending above that level this year. Cratty noted that the last structure fire of comparable magnitude to this one occurred on November 9, 1998 where a 38-year-old woman was rescued from her bedroom and had to undergo extensive treatment for smoke inhalation.